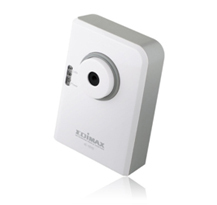 The Edimax IC1510 works with video. IP cameras can be used under the Motion Wrapper to enable it to detect motion and alert based on that function. NOTE: I still need to test the alerts. Open your webadmin control panel and on the left pane at the bottom click on "Show Device Tree". In the left pane Click on "core/hybrid". On the right pane near the top, click on "Create Child Device", then leave everything blank and click "Pick Device Template" button. Click the pull down box under "Device Template" and find the template labeled "Motion Wrapper", select this item and click "Pick Device Template"
Now on the right pane, click "Create Child Device" again. Enter your IP Cameras IP address and MAC address here, the MAC address is located on a sticker on the back of the camera, then click "Pick Device Template"
Click the pull down box under "Device Template" and use "Generic Motion IP Camera", then click "Pick Device Template"
Now click save at the bottom, reload your router, and on your mce interface go to "Security" -> "Generic Motion IP Camera" to see if it's working. I had to reboot my server to get it working. This page was last modified on 28 September 2010, at 15:58.